Dr. Albert M. Kligman was a dermatologist who, along with his colleagues, first identified the use of retinoid acid as a treatment for acne and wrinkles in 1986. Retinol is a vitamin A derivative and part of the retinoid family along with retinaldehyde (retinal), retinyl palmitate and retinal acetate. Over 40 years of established research and more than 700 published studies show that retinoids are helpful in treating ageing skin by increasing firmness, reducing fine lines and wrinkles, and improving skin tone and texture. The current definition of a retinoid is any molecule that, by itself or through metabolic conversion, binds to and activates the retinoic acid receptors, thereby eliciting transcriptional activation of retinoic acid-responsive genes that results in specific biologic responses. Retinoic acid is the only form of retinol that the body can use. Therefore, specialized enzymes in skin cells must be used to convert other forms of vitamin A into retinoic acid. Some forms of vitamin A are more easily converted to retinoic acid than others. As shown above, it takes two metabolic steps to convert retinol to retinoic acid and three steps to convert retinyl palmitate to retinoic acid. Therefore, a relatively large amount of retinol and even larger amount of retinyl palmitate need to be delivered into a cell to boost retinoic acid levels and produce clinically meaningful effects. AlumierMD always recommends conditioning the skin by starting with a low-percentage retinol product like Retinol Resurfacing Serum 0.25 or 0.5, since mild redness, peeling and irritation can occur when you begin using retinol products. 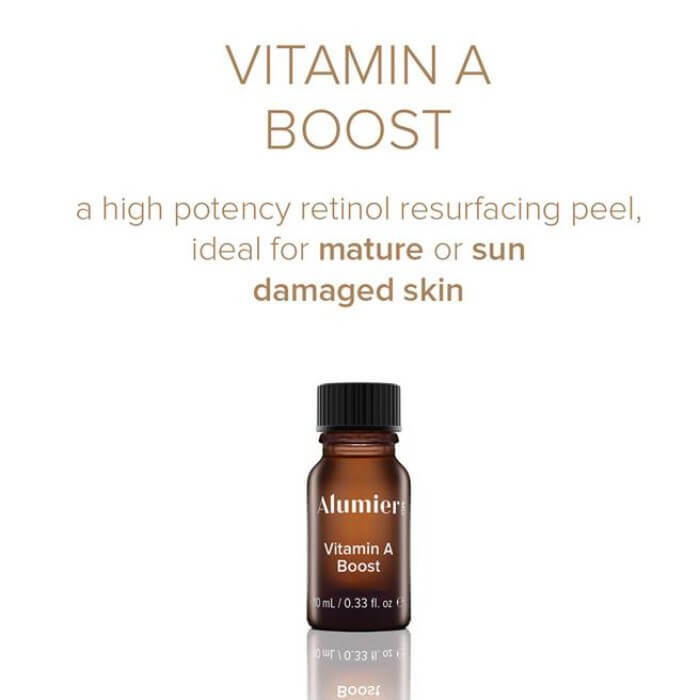 AlumierMD’s Retinol Resurfacing Serums contain encapsulated retinol using cutting-edge technology to allow for a gradual time release overnight. By encapsulating the retinol and adding soothing and hydrating ingredients like niacinamide (vitamin B3), aloe and sodium hyaluronate, maximal results can be achieved in comfort. Want to find out more? Read the AlumierMD’s full scientific paper on Retinol here.